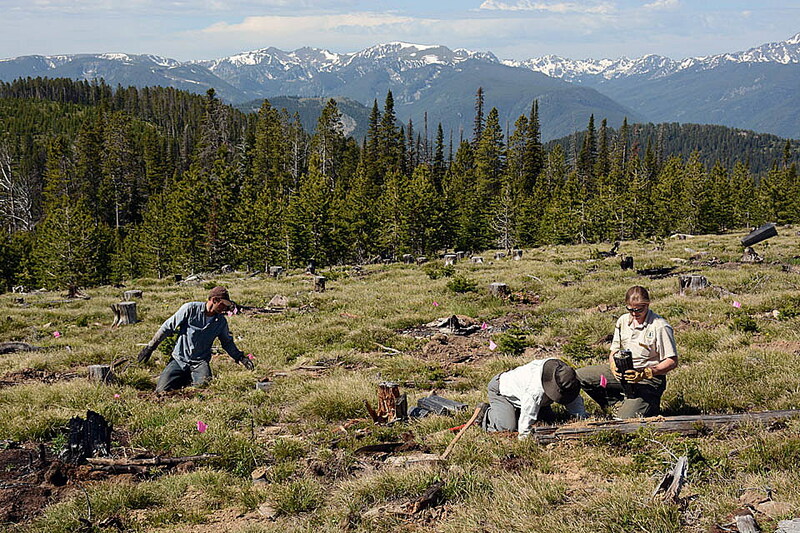 Should whitebark pine seedlings be planted in wilderness areas? With almost 8 billion people spreading into the most remote regions of the planet, should some places be set aside to exist without humankind’s interference, no matter how well intentioned? That question was at the root of Monday night’s panel discussion on whether to restore whitebark pine in Montana’s wilderness areas. The Whitebark Pine Ecosystem Foundation and the University of Montana Wilderness Institute sponsored the event at Imagine Nation Brewing Company. Some foundation members want the U.S. Forest Service to plant whitebark pine seedlings in wilderness areas to replace thousands of trees that have been lost, at least in part, to climate change. Whitebark pine evolved to live in the cold conditions of high elevations because it doesn’t have the defenses against parasites that other pines have. In the past, that was enough to keep mountain pine beetles and blister rust at bay. But longer summers and warmer winters caused by climate change have allowed beetles to spread farther north and higher in elevation, and to produce two rounds of offspring each year instead of one. That led to a beetle outbreak in the 2000s, which wiped out a majority of whitebark pine in 16 of 22 mountain ranges in the greater Yellowstone ecosystem. While beetles attack mature trees, exotic white pine blister rust tends to infect younger trees. Blister rust has been spreading into Montana from the west and could harm upcoming generations of whitebark pine. So now, high elevation forests of the Rocky Mountains are dominated by stands of gray ghosts, the remains of ancient whitebark pine that once produced seeds used by squirrels, Clark’s nutcrackers and grizzly bears. Forest Service research ecologist Bob Keane wants to restore whitebark pine in wilderness areas, which account for 45 to 55 percent of the species’ range, because the population throughout the Rocky Mountains has dwindled to where trees no longer produce enough seeds or pollen to make healthy new stands. So focusing on restoration in areas outside wilderness isn’t enough, Keane said. Also, most existing stands aren’t resistant to blister rust. But since 2012, the Forest Service has propagated and planted a small percentage of rust-resistant tree seedlings on national forests. Keane argues that seedlings should also be carried into the wilderness, even though it would be an expensive process. But wilderness, as protected by the 1964 Wilderness Act, was not created to lock ecosystems in time, said Wilderness Watch executive director George Nickus. That’s what national parks try to do. Wilderness areas are set aside to allow nature to act without the dominating hand of man. Planting hundreds of seedlings, killing invasive trout or spraying for weeds are the acts of people who have an idea of how they want wilderness to look, so they still take matters into their own hands. Some of the 50 people in the audience scoffed as they pointed to the section of the Wilderness Act that defines wilderness as an area “untrammeled by man, where man himself is a visitor who does not remain.” They argued that nowhere on the planet now escapes the influence of man, so planting trees shouldn’t be a big deal. But Jimmy Gaudry, USFS Northern Region wilderness program manager, said it might be a big deal, depending on how many other groups want to manipulate the wilderness for their special purpose. Gaudry said he encouraged the discussion, but a more neutral process was needed, where trust could be built between stakeholders and where people would do a better job of listening to each other. But for now, the Forest Service would lean on policy and law, which provides “solid direction regarding wilderness management,” Guadry said.